The sun is shining (insert Happy Dance)!!! The snow is almost completely melted…I have a patio again, and mud…lots of mud! But the sun is shining and I don’t care 🙂 Our High temperature today will be in the 50’s for the first time in, like…..forever! I am already eyeing the barbecue grill out on the patio, just waiting to be able to fire it up and grill a big old juicy steak. 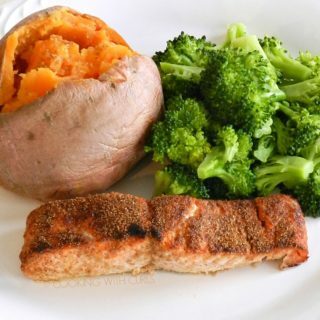 But for now, I will broil my Spice Rubbed Salmon in the oven….. 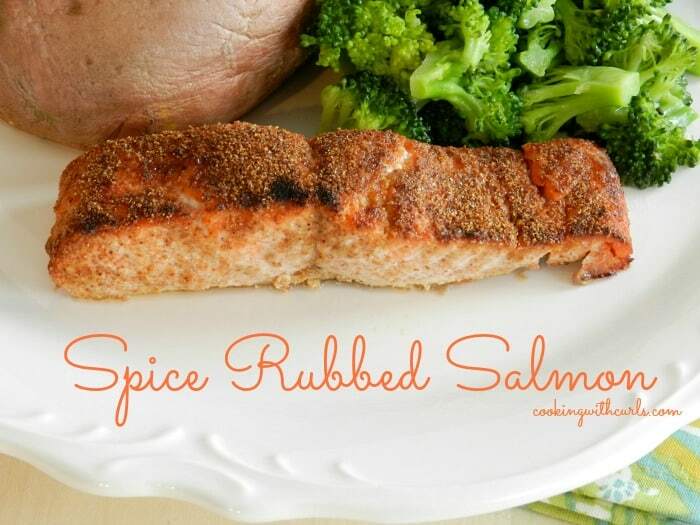 I love salmon, and I am always on the look out for new ways to prepare it! A couple of weeks ago I found a recipe Marcie @ flavorthemoments had posted and it sounded awesome. It also kinda looked similar to a seasoning that I had used before on barbecue chicken, so I combined the two and created my version of spice rubbed salmon. It is super easy to make, and has a sweet and spicy flavor that everyone in the family will enjoy. 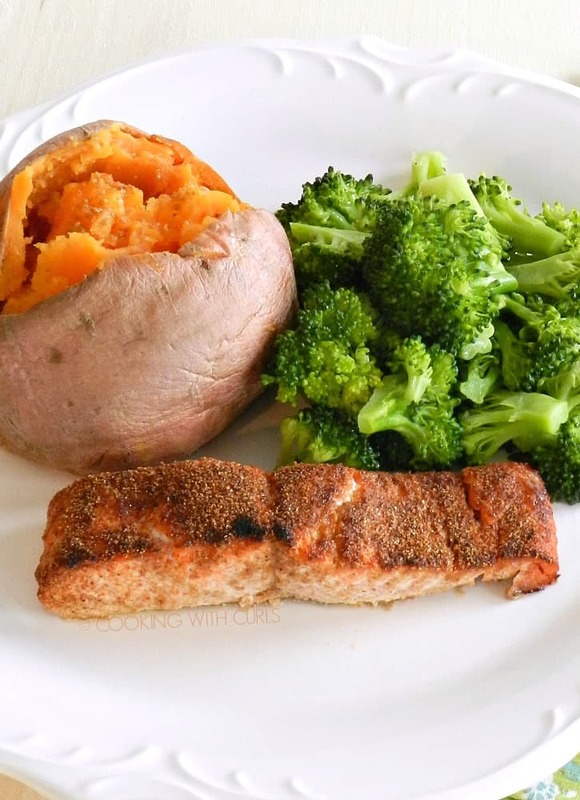 I even kept the sides really simple, steamed broccoli and baked sweet potatoes…..YUM! Remove from oven and serve….. Your salmon looks wonderful, Lisa! Thanks for the mention. Your site is looking nicer and nicer! I’m working on mine, too. I love salmon and this is a perfect recipe for spring and summer with salads. For reasons I won’t go into, I have a freezer full of beautiful salmon. I’m always looking for a new way to cook it, so I’ve written this down and will give it a try. Looks yummy – I think I won’t need the olive oil since the fish is so moist. Happy SITS day!